Medical education faces a host of obstacles in coming decades requiring that it rethink the way it delivers medical curricula, especially with regard to critical thinking and differential diagnostics. Traditional didactic curricula must be coupled with emerging technologies that provide experiential learning without risk to patients while not eroding the clinical effectiveness of advanced medical learners. Virtual-world technologies have advanced to a level where they must be considered as a method for delivering medical curricula effectively and safely; moreover, research must establish that such systems are reliable and valid means for delivering medical curricula; otherwise, they are of no use to the medical community, regardless of their technical sophistication. Pulse!! The Virtual Clinical Learning Lab is a project designed to explore these issues by developing a reliable and valid learning platform for delivering medical curricula in virtual space, space usually reserved for entertainment videogames. Medical education must reform to stay abreast of rapid change. Baby-boom retirements from academic faculties and other demographic factors are creating looming shortages of medical personnel, especially physicians and nurses (Rasch, 2006). Shorter hospital stays and medical residents’ workweeks are reducing clinical training opportunities and expertise development (e.g., Verrier, 2004). Continuously changing warfare and terrorist technology and methods drive a need for rapid deployment of training for continuously evolving medical treatment (Zimet, 2003). Battlefield fatalities from potentially survivable injuries might have been prevented with consistent application through more effective training of U.S. armed forces’ Tactical Combat Casualty Care (TCCC) guidelines (Holcombe, et al., 2006). Simulation is an established, effective means for providing medical training and education. Issenberg et al. (2005) conclude “that high-fidelity medical simulations facilitate medical learning under the right conditions” (p. 24). This first comprehensive review of 34 years of research on the efficacy of simulation in medical training found that “high-fidelity medical simulations are educationally effective and simulation-based education complements education in patient care settings” (Issenberg et al., 2005, p. 10). Issenberg notes that the medical community’s increasing interest in simulation and virtual reality (VR) is driven in part by “the pressures of managed care” that lead to fewer clinical opportunities for medical learners, including practicing physicians constrained by shrinking financial resources to spend less time keeping abreast of developing medical topics. Issenberg cites a 1997 study by Mangione & Nieman, which found a decline in bedside acumen and urged “the use of simulation systems for training” (Issenberg et al., 2005, p. 12). Reznick and MacRae (2006) observe that well-established motor learning theory (Fitts & Posner, 1967), as it applies to surgical training, ratifies the use of simulators in the acquisition of skills through three stages – cognitive, integrative, and autonomous. Ericsson (1996) applies a thicker description directly to surgical training with the concept of “deliberate practice” defined as “repeated practice along with coaching and immediate feedback on performance” (Reznick & MacRae, 2006, p. 2665). 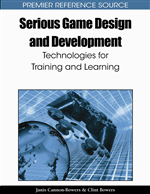 Watters et al (2006) propose that substantial learning occurs through what has become standard entertainment-game architecture, including instantaneous feedback, a rising scaffold of challenges, visible goal indicators, personalization and customization, fluidity and contextual grounding. Watters and Duffy (2004) propose “a framework of motivational constructs” (p. 16) found in games that are applicable in developing interactive health-related software: self-regulation, or autonomy; relatedness, which includes role-playing, narrative and personalization; and competency, or self-efficacy built upon completion of meaningful tasks. Virtual-world technologies are emerging as the next big step for medical simulation. “We are in a complete revolution in surgical education,” according to Richard Satava, a professor of surgery at the University of Washington. “If history serves us well, such a revolution occurs only once every hundred years, as evidenced by the fact that the last revolution began in 1908 with the Flexner Report. Whatever is established during these next 10 years is likely to endure for the next century” (Satava, 2008, p. 2).